It's over. My heart is having trouble coming to terms with the fact that this was the end. No more Blue and Gansey. No more Ronan and Adam and Noah. No more time spent at 300 Fox Way. It was beautiful and ugly, and now it's over. 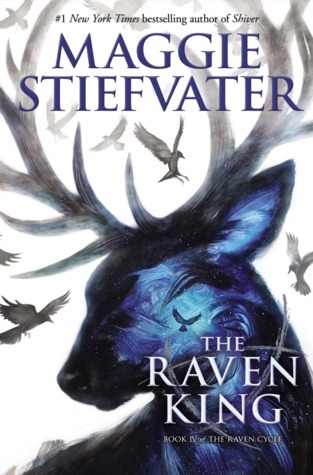 It's so new that I don't want to say too much and spoil the fun for others, but the The Raven King takes off exactly where Blue Lily, Lily Blue left off. Maura, along with her estranged...Artemis...has been found and Neeve has helped Piper release what should not be released, and Gansey is still doomed to die at the hands of Blue. With the ante "upped" and Cabeswater seriously on the fritz, the group is desperate to find Glendower. I'll just leave it at that, because it's best that you explore the ending on your own. My final thoughts. This one felt different. It felt a bit chaotic and disjointed at times, almost like there was to much to wrap up, so it hopped around trying to get to everything. It gave me what I wanted on a couple of occasions, but I feel like a lot was left unsaid, undone, unresolved. I'm reading it again. The first run through happened way too quickly because I was desperate to know how it ended. So now I'm trying to enjoy the ride. Hopefully some of those unresolved moments will feel cleared up during this second round. What was completely evident throughout (in my opinion) however, was the fact that this story was never really about the search for a king. It was the search for family and friendship and self. It was a story of dreams. Of characters that felt real and lives that were changed. Man I heart Maggie Stiefvater.